There are various ways of worship in our religion and all have equal importance. Three are some differences but one thing is common in all ways and this thing is music. Music plays most important role in maximum methods of our worship. Singing of an aartee is a must at the end of the idol-worship. Mantras are recited in their musical melodies. Singing of prayers vandanas studies and Bhajans is the strongest pillar of our religion and most popular too. It is also the easiest way of worship, which provides mental peace and joy to singers players of various musical instrument and listeners. You may sing and play on your musical instrument the Bhajans prayers studies and aartees of your choice it us the main object of this book. Some bhajan singers are much popular than film playback singers today. Pankaj Udhas Anoop Jalota Jagjeet Singh Lakhvindar Singh and many others are the shining stars of this field. In every city and town there are several orchestra groups and bhajan-mandllees those perform bhajan -ssndhyas and jagrans. If you have a sweet voice you can easily become a singer of these groups while any person can easily become a professional player of his musical instrument with the help of this book. I am very interesting Bhajans . 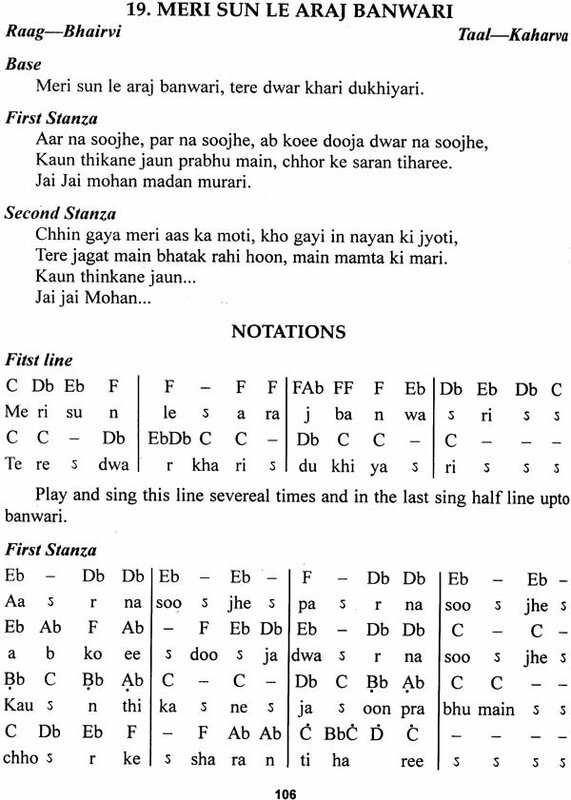 can someone give me the notation for "o duniya ke rakhwale"
I would like to buy Hindi bhajan notations and how can I buy it. I would like in Hindi notes or english hindi like Ss Rr Gg Mm Pp Dd Nn Ss notes. Also do you add especial request to add more Kirtan notations or book for kirtans / bhajan that i like most. Let me know. Do you have book on notation for sitar please? Hi, What would it cost to be shipped to Auckland, New Zealand and is it possible to get a sample bhajan in order to see whether it is easy to understand or not. Can you please send me a sample bhajan with its notation to see if i can understand it. I'm interested in purchasing "Notations of 121 Bhajans and Prayers". Do you ship to Canada? theses notations are in western notes or sargam . i want to buy this book,could you deliver this book at home. Please send me musical notes for harmonium playing on the Hanuman Chalisa and other bhajans. I am looking for Bhajans written in English with Sa Re Ga Ma notations. I want to purchase this key board notation. but before i purchase i want review the notation. please help me, i am learning to harmonium (binaa). I am learning to play Key Board and would like to have notes on favorite bhajans. Need Bhajan notations to play on Veena. 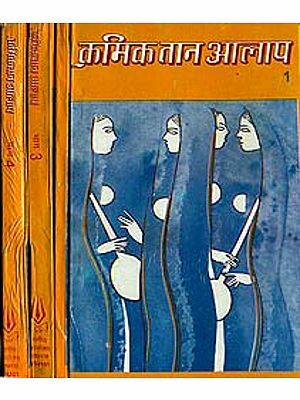 I have 2 bhajan books with hindi notations. i am learning how to play piano. I AM LEARNING TO PLAY HARMONUIAM AND I WOULD BE GLAD IF YOU COULD SEND ME SOME BHAJAN NOTATIONS. send me an email if u like it. how can i order this book?